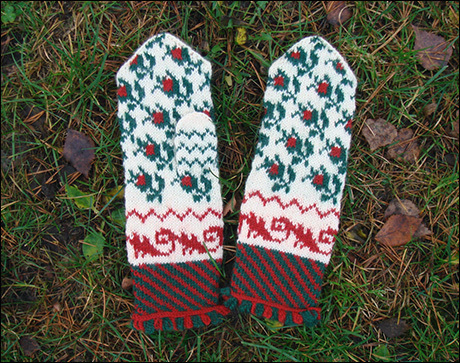 The pattern is originally from Kurikka, and the mittens are called Kurikka-rasat, rasa being a dialectical word for the Finnish word for mitten, lapanen. Kurikka is very close to Ilmajoki, where my pattern is from according to the museum’s archives. So I think we can conclude that the Rosebud pattern is the Kurikka mitten made in Ilmajoki, where the zigzags have been added. 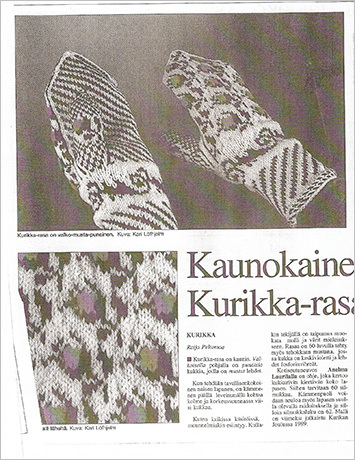 The original Kurikka mitten is not having these zigzags. There are several variations of the pattern around. One has the flower buds and the stripes going in opposite directions on left and right hand. 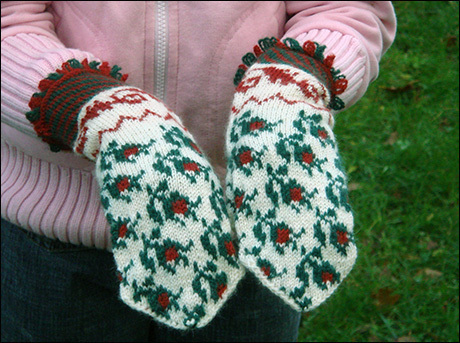 One variation is to knit the inside of the hand not with flowers, but with stripes instead. 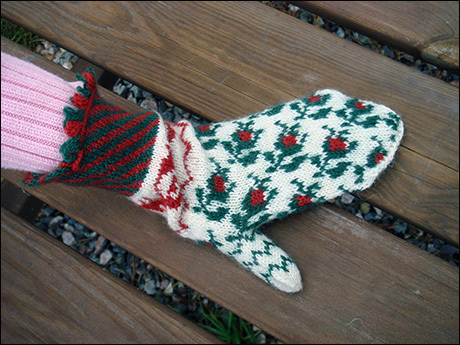 The thumb can be knitted with stripes, and has also been knitted with a gusset and one single flower bud together with stripes and dots (see picture above). The traditional colours seams to be black (instead of green), white and red, but about 50 years ago it was also knitted on black background with phosphorus green leaves and purple buds. That must have been a colourful mitten. In Kurikka there are still workshops held to teach the interested in how to knit the Kurikka mittens Talk about living traditions! Here is a picture of the mittens with blue background and in the traditional black-white-red colours! The Rosebud mittens have finally reached the point where I can publish a pattern for them, and give you all more details on them. The model for these mittens can be found in the collections of the Finnish National museum. The mittens are from Ilmajoki in Pohjanmaa in Finland. I have based my pattern on the drawings I made when I saw the picture of the mittens, and thus not having had the actual mittens in my hands, this is not an exact reproduction. The colours and the patterns of these mittens are more accurate than on the first pair of mittens I knitted in the end of last year. If you want to learn more about the pattern, that without the zigzags is called the Kurikka mitten, go here! The swirling pattern above the diagonal coloured cuff is called ässänväärä, and is an old rococo pattern that also can be found on painted furniture in the same area. I haven't seen this pattern, as far as I can remember, on any other mittens than Finnish mittens from the Pohjanmaa area. Similar flower motifs as the rosebud, even if not exact the same, can be found in all of the Baltic Sea area, in Estonian, Swedish and Finnish mittens. These mittens involve long strands on the inside of the mittens. This is an issue you have to decide how to deal with. First of all, you can weave in the yarn not in use. I don't like this method, since I can't do it without contorting the stitches, and having, especially when using colours so far from each as in this mitten, the yarn woven in to show up on the right side. The second option is to strand the yarn not in use on the backside. This will cause some difficulties when putting your hand into the mitten, you risk to be caught up in the strands with your fingers, and if the mitten is made for a child, this problem will be accentuated. As I see it, you have three ways to deal with the problem. You can use a thin yarn and knit an inner mitten, thin angora yarn for example would make a wonderful inner mitten for the hand part of the mitten. The inner mitten can be knitted loosely and be very open in its texture, the only aim of the inner mitten is to protect the strands from your fingers being caught up in them. 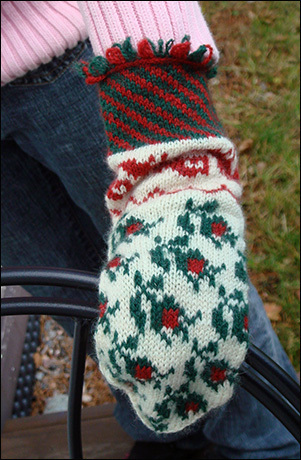 The second option is to lightly felt the inner side of the mitten. This will happen naturally when you wear the mitten, and if you're careful enough, it might be the only thing you need to do. With these mittens I will go for a light felting, and hope it will be enough to protect the strands until the inside naturally felt up more. The third option is to do nothing, just being extremely careful when putting your hand in the mitten, and then hope for a fast self-felting. Yarn: Vuorelma Satakieli or similar 2 ply 100% wool. I have used the colours 001 (off white), 491 (red) and 890 (green). Needles: 2mm and 2,5 mm dpns. Finished size: From fringe to top 25 cm, around the hand 17 cm (suitable for my 11 yo daughters hand). Cast on 60 stitches with 2mm needles. I have made a tutorial of how to do this fringe cast on with two colours in the way Mary Olki instructs to do it in her book "Kirjokintaita ja muita kansanomaisia neuletöitä" from 1950's. Cast on three stitches in green and two stitches in red. When you have finished the cast on, decrease on stitch on the first pattern row in order to get the stripes to overlap neatly. Start knitting according to the pattern. When you have finished the striped cuff, change to white and 2,5 mm needles and increase one stitch before starting the ässänväärä pattern. You have now 60 stitches on your needles, divided evenly on four dpns. Continue knitting according to the pattern. Thumb: When you have finished the first row of rosebuds, knit 18 stitches according to the pattern. Knit 11 stitches with a waste yarn, then slip these 11 stitches back on the left needle and continue in pattern. Shape top: When half way through the fifth rosebud row (or when mitten reaches approx to the top of the little finger) start decreasing at the end of the second and beginning of the third needle. Slip the two last stitches on the second needle at once as if to knit, knit the first stitch on the third needle and pass the two slipped stitches over the knitted stitch. Leave the knitted stitch on the second needle. Two stitches decreased. Continue in pattern until the two last stitches on the fourth needle are left. I prefer to knit the last stitch before the decreases (the one that will be decreased on next row) in the same colour as the decrease will be, I think it makes the decreased stitches more even in colour, but you can knit the pattern until the last stitch if you want to. Continue decreasing this way until you have eight stitches left. Break the yarn, and thread it through the remaining stitches. Thumb: Remove the waste yarn and pick up 11 stitches for the front and for he back of the thumb. Knit according to the pattern, but pick up one stitch in the beginning of the first and the third needle, you will now have 24 stitches on four needles. Two rows after the third zigzag row start the decreases for the top, using the same method as when decreasing for the top of the hand. Knit as the left hand mitten, but when you have knit the first rosebud row, knit 31 stitches before knitting 11 stitches with waste yarn for the thumb. The thumb will be knitted at the beginning of the third needle, when the left thumb was at the end of the second needle. Download a sharper chart for the mittens here! Requires Excel. If you decide to knit these mittens, I would love to see pictures of your interpretation! Please leave a comment with a link, or email me! If you have problems understanding the pattern, feel free to contact me. You can reach me at mfast(at)welho.com (remove the () around @). And remember! This pattern is for personal use only! You’re not allowed to sell or distribute it, or to sell mittens you have knitted from it. You can print a copy for your personal use, but for any other use of the pattern or any pictures in it, you must contact me and ask for permission. If you want to know more about copyright, you can take a look here: What is copyright protection?